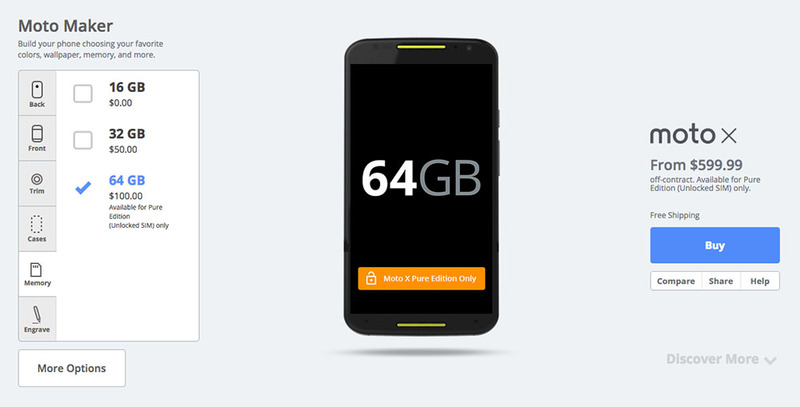 Motorola, in a not-so-surprising-semi-expected-but-very-frustrating-for-early-adopters move, announced this morning that the Moto X (2nd gen) “Pure Edition” can now be purchased with an optional 64GB of storage. The jump to 64GB will cost an extra $100 over the 16GB model, but you should certainly consider going with the extra storage, since this phone doesn’t have a micro SD slot. For now, the 64GB option is only for the unlocked “Pure Edition,” which is sold without a contract and works on both AT&T and T-Mobile networks. It will cost you at least $599, depending on the other options you pick. If you are buying the Moto X (2nd gen), the “Pure Edition” is the version we would recommend going with because it receives updates faster than any other version of the Moto X and isn’t directly affiliated with any carrier.